Our photo shows tel Socoh in center (look to the left and above the horizontal road that dissects the field in center). 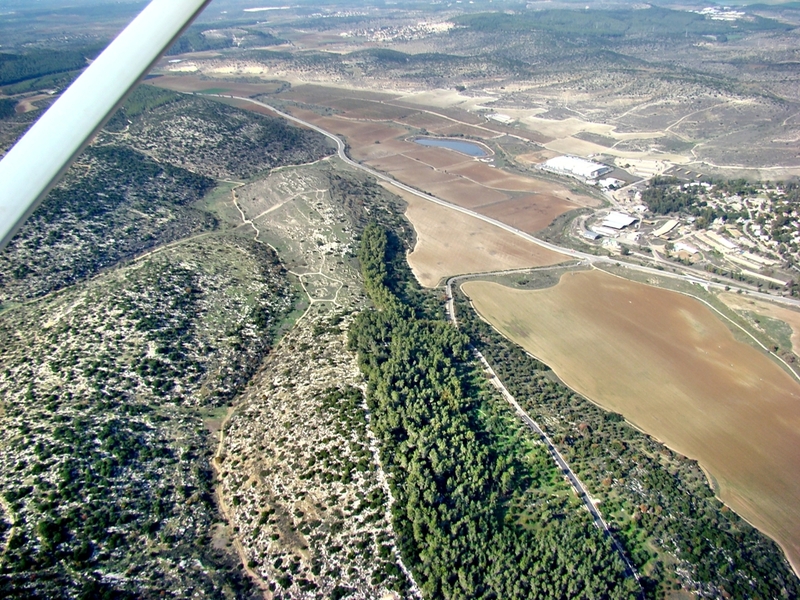 Aerial of Socoh in Elah Valley. Scene of Philistine-Israel Battle of 1 Sam. 17. Photo ©Leon Mauldin. If you note the tiny tree-line above tel Socoh, across the road, this is the brook from which David selected five smooth stones, one of which he used to slay Goliath. In the distance (just right of wing brace at top) you can see tel Azekah. For 40 days this valley rang out with the threatening voice of loud-mouth Goliath, until the shepherd David rose to the challenge, prompted by this faith in the God of Israel. Socoh (also spelled Sochoh and Soco) had earlier been assigned to the territory of Judah (Josh. 15:35). Later it was fortified by Solomons’ son King Rehoboam (2 Chron. 11:7). Later still, in the days of King Kezekiah, Socoh was among the cities of the Shephelah listed in 2 Chron. 28:18 as raided and conquered by the Philistines. Apparently Socho had been an administrative center during Hezekiah’s reign as indicated by the numerous stamped jar handles with the seal of Socoh. This entry was posted on Thursday, October 21st, 2010 at 12:19 PM and is filed under aerial photos, Archaeology, Bible History and Geography, Bible Study, Israel. You can follow any responses to this entry through the RSS 2.0 feed. You can leave a response, or trackback from your own site. Thanks for the post and the excellent photo. I’d like to make a brief comment on Khirbet Qeiyafa’s identification. Dr. Yusef Garfinkel, Dr. David Adams, Dr. Michael Hasel and Mr. Saar Ganor of the IAA (members Kh. Qeiyafa’s excavation staff) have identified Khirbet Qeiyafa as the biblical Shaaraim. (1 Sam. 17:52) “Shaaraim” is the Hebrew word for “two gates” – and Khirbet Qeiyafa is the only city in that period and region that has two gates. (The gate was the a weak point, so cities typically had one.) The name Shaaraim matches a unique feature of the Qeiyafa site. This identification is not universally accepted but to my knowledge there is no widely-acknowledged counterargument at this time. “Efes-dammim” translates along the line of “the bloody border” – which may indicate a region rather than a specific settlement. Perhaps an allusion to frequent conflict in this border region? There is not 100% certainty on either of these so other explanations cannot be ruled out, but the Shaaraim ID appears to be the strongest match for Qeiyafa in lieu of some other yet-to-be-discovered evidence. Thanks again for your posts and pics! Luke, thanks very much for your comment. I think the work that is being conducted at Khirbet Qeiyafa is fascinating. Keep us posted on further developments!